This is the third post in my series on the Loire Valley. 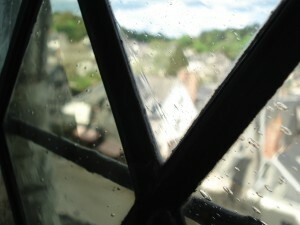 Like this one, the last post was on a castle and the first one about a bed & breakfast. Part 3: Warning: Medieval Obsession! As many of my friends know, I’m slightly obsessed (no, much more than slightly) with medieval history. That’s surely one of the reasons I enjoy living in France so much- almost everywhere you turn, there are remnants of the architecture from this fascinating period. Of course, the Chateaux de la Loire, are among the edifices that get me the most- for their imposing structure, as well as for their intriguing history. A mere 6 miles from Azay-le-Rideau is Langeais, an historic city sporting a lesser-known castle that is certainly worth visiting. The Chateau de Langeais was originally built in 1465, near the end of the medieval period. Although its looks like a fortified castle, our guide told us the chateau was purely residential and not used for defense. Unlike many others, it was not built on a hilltop, but directly in the city. What struck me were the large windows and sunlight that poured through them. Our customary image of a medieval castle is one with tiny windows and very little light. It was also interesting to observe the use of space in the Middle Ages. A single room would have had many functions and the notion of privacy wasn’t the same as today. For example, the royal “bedroom” also served as a room to receive guests. Today, we usually don’t dare ask to go into our hosts’ bedrooms! During the visit, I learned that it wasn’t until the 15th century that we began moving toward the specialization of space. Back to architecture: Next to the castle, you can still see the remains of the “oldest donjon in France” which dates back to 994 when the ferocious Foulque Nerra, Count of Anjou, took possession of Langeais. Don’t get confused: the French word donjon is best translated to the English “keep” or “strong hold.” In other words, it’s the large round tower in a fortified castle. Our common English use of the word “dungeon” refers to the cachot or oubliette– the dark underground prison. The word oubliette comes from the French oublier which means “to forget.” I wouldn’t have wanted to be one of these unlucky prisoners! Next and last post on the Loire Valley: what we ate.